Born Baltimore, Maryland, May 10, 1959; Married; Three Children; Admitted to Maryland Bar, 1985; Education: University of Maryland (B.A., 1980); University of Baltimore School of Law (J.D., 1984). Jud manages the Firm’s Complex Personal Injury and Wrongful Death Negligence Practice that includes cases involving serious motor vehicle accidents, truck and bus transportation disasters, premises liability injuries or death caused by dangerous and hazardous conditions or inadequate security, private airplane crashes and commercial airline disasters and other areas related to negligence, insurance, aviation and uninsured/underinsured motorist law. Jud also represents clients in a wide variety of business transactions. In particular, Jud has successfully negotiated mergers and acquisitions for many health care professionals and other businesses involving buyers and sellers on the local and national level. Jud is Past President of the Northern Maryland Chapter of MADD. 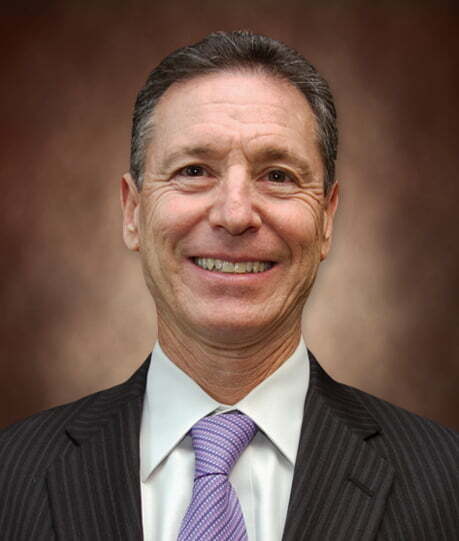 He has lectured and appeared on radio & television regarding the dangers of drinking and driving and has been committed to representing victims injured or the families of loved ones killed by drunk drivers for more than 30 years. 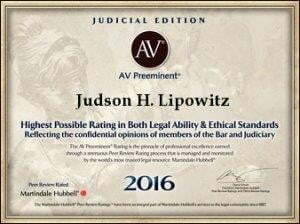 Mr. Lipowitz has been consistently recognized with the AV Preeminent rating from Martindale Hubbell. This is the highest possible rating in both legal ability and ethical standards reflecting the confidential opinions of members of the Bar and Judiciary.